1) Blanch sliced lotus root in boiling water for 2 minutes. Remove and drain. 2) Heat 4 tablespoons oil, saute ginger slices for a minute, add in beancurd paste and fry for 1/2 minute. 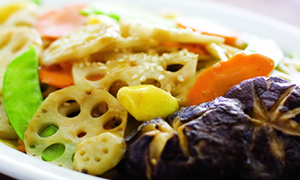 3) Add in carrots, lotus root, mushrooms and gingko nuts. Stir-fry for 1 minute. 4) Then add in 1/2 cup water, mixed well and cook mixture with a cover for 3 to 4 minutes. 5) Put in seasoning and turn off fire. Just before serving sprinkle some toasted sesame seeds over dish.